What features and/or tools would you like to see augmented or improved on Chazhound? Yah, totally NOT a fan of anonymity in most cases, especially if you disagree. If you disagree with something you should be willing to say so openly. I can see way too many pitfalls with having a way to anonymously disagree. You have NO IDEA how much drama there is over that one little button. It's actually pretty entertaining on that forum but I suspect that's largely because I don't know many people over there and thus don't care about the internet bloodshed. I like the other buttons though and I think they could work well on this forum. One of the things I worry about with the "like" button is that it'll lead to less posting, especially on picture threads. There are some picture threads where people get very few replies and if you have the option to just "like" it I worry that'll decrease the replies even more. I mean, there are many times I've found myself going "If only we had a 'like' button" but because we don't I posted instead which I think adds more. Yeah I know what you mean about the photothreads, but a lot of times people ARE looking at them, they just dont' know what to say, especially if they're looking at multiple threads. I know it's been said before but sometimes it's hard to come up with a unique comment for each of them and while I'd like to leave a little something on each, there's only so many threads you can say "aww cute!" on before it seems insincere. So while comments may go down I do think they'll get substantially more recognition via "thank you"'s or "likes" or whatever. I dunno, maybe it'll even out? Good point on the "like" button. It may cause less interaction. Huge fan of Tapatalk here. It's used on a breed related forum that I moderate and others that I visit. It's used by a lot of members, and it really makes surfing from a mobile a nice experience. Those using phones and tablets to access will find that it's a smooth experience. I have another other. Because this is like the hundredth time I've done this, can we please move the "Mark Forums Read" link out from under the "Today's Posts" link? I hit it all the freaking time on accident. Especially on my phone. It makes me sad. I just want my little red man back in chat. I picked ability to embed video (because otherwise, honestly, I don't watch them ) and "like" button! Definitely the like button. I'm on a another dog forum with a like button and always feel good coming on and seeing a got a bunch of likes for something I wrote. I know I'd feel weird writing out a post just to say I agree with someone, unless the post was epic or something, so a like button let's people know you agree and like what they have to say if they don't have other input to add. I can see how that might be bad on picture threads though, I should post more on picture threads, I look at them all but always feel cookie cutter writing that the dogs are cute/beautiful/whatever even though they are. But I should do it anyways, I know it makes people feel good. Is there anyway to not put a like button in the picture section but have it in the rest? I don't think a disagree button is a good idea lol. If you disagree you probably have a reason and should state it, otherwise what's the point? I don't use chat, chats cause me anxiety. And my phone allows texting and phone calls, so I don't even know what the phone one is lol. I might be more likely to watch embedded videos, I don't know. 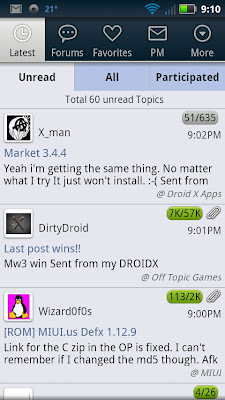 Because I won't rest until Tapatalk is activated, I took a couple of screencaps to show you its awesomeness. You can also chose to reply with quote. 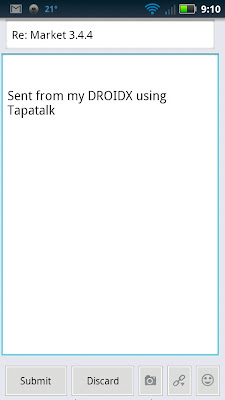 You can upload Tapatalk hosted pics directly from the app. It's so nice!